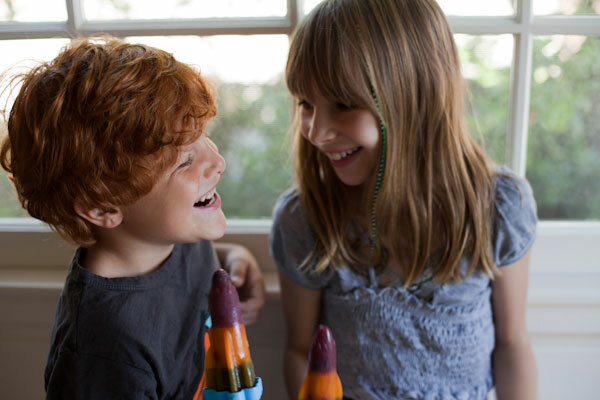 What could be more fun than a bright striped rocket popsicle? 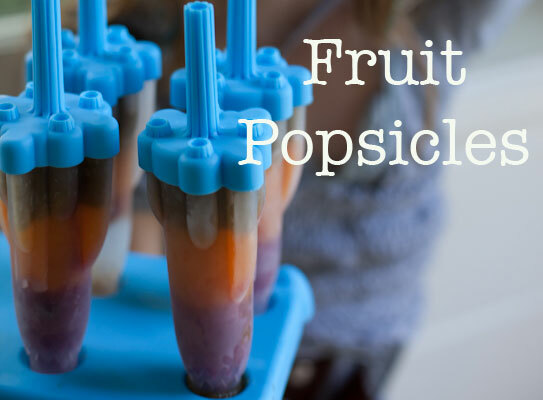 They are super easy to make – I used Naked fruit juice from the supermarket – Mighty Mango, Blue Machine and Green Machine – but you can also make up fruit smoothies from scratch. However, since you don’t need that much it seemed like a lot of work – plus the juices are all natural and 100% juice. With a little planning ahead you’ll be ready for blast off and that extra serving or two of fruit in no time. 1. Place a couple of blueberries in the bottom of each rocket pop mold and add a layer of the blueberry juice – 1/3 of the way up the mold. Freeze until solid, about 30 minutes. 2. Place a couple of raspberries on top of the frozen blueberry layer and add the mighty mango juice up to 2/3 of the way up the mold. Freeze until solid, about 40 minutes. 3. Place a couple of kiwi pieces in the top of the mold and add the green juice to almost to the top of the mold, you need to leave about 1/4 inch. 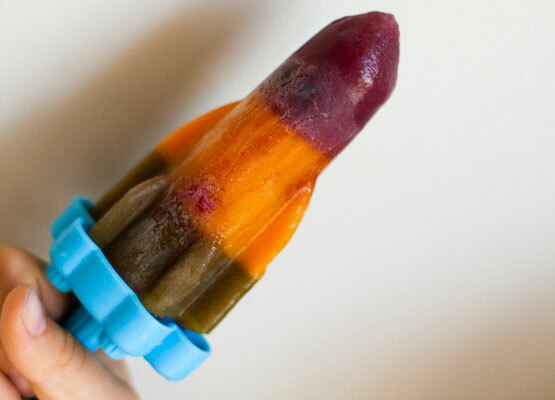 Place the lid on top – this becomes the holder/stick for the Popsicle. Return to the freezer until completely frozen, at least 2 hours. 4. Remove the cover by running under hot water for a few seconds and enjoy! So easy and perfect for the insane heat. I’m living on popsicles this summer! How festive, I used to love those as a kid. 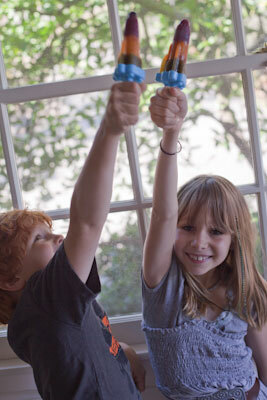 Your kids are adorable, and these Popsicles are so fun! My teens are addicted to Naked Juice – during La Crosse season I go through it by the gallon so these are right up my alley!!! remember these as a kid? man i used to get so excited (and proud) when I had one of these. and now here we are years later, and we can make them at home. wild. Not sure how I missed these before, but YUM! What a great treat for the kiddos! love these popsicles…i’ve been eating pops like nuts these past few weeks!! but i must get these awesome molds!